Determined to make performance ground on its V8 Supercarsrivals as soon as possible, Erebus Motorsport will set aside its sophisticated driveby wire throttle technology and revert to the cable actuation used by the restof the field. Drive by wire and dual throttle butterflies had beenapproved for the team’s three Mercedes-Benz E63 AMG V8 Supercars because it wasa system used by the M159 6.2-litre engine production engine. However, the 2D ‘E-Gas’ system, has proved difficult to tunewith the 5.0-litre racing version of the M159 and Erebus and its Germantechnical partner HWA, will introduce a new cable-operated eight butterfly inletmanifold in time for the Chill Perth 360 in early May. 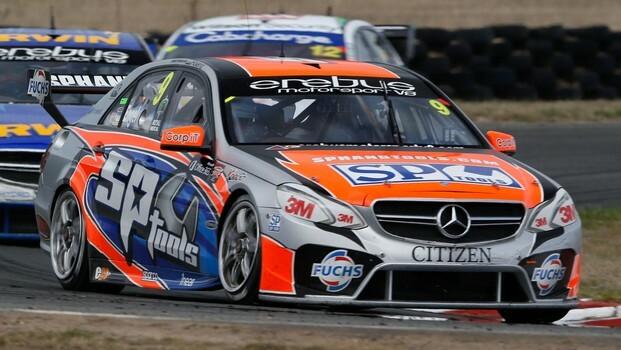 Erebus and HWA had applied to V8 Supercars to upgrade from a2D to 3D E-Gas system, which would have allowed more sophisticated throttlemapping and resolution of the engine issues, which predominantly revolve arounda lack of bottom-end torque and fuel over-heating. However, the V8 Supercars Commission denied that applicationand also ruled the introduction of drive by wire throttle across the fieldwould be delayed from 2014 until 2015. The other technical dispensations handed to the ErebusBenzes – the flat plane crank, electric-assist power steering and E-cell seat –are unaffected by the changes. The change of technical direction became public at lastweekend’s Symmons Plains championship round, which was attended by three seniorHWA engineers, including managing director Gerhard Ungar. They made the trip after Erebus CEO Ryan Maddison, teammanager Dave Stuart and senior engineer Wes McDougall travelled to Germany formeetings with HWA and consultations with AMG. The Tasmania Microsoft Office 365 also marked a performance milestonefor Erebus despite fears its engine issues would relegate it to the back of thegrid at the fast circuit. Instead, Lee Holdsworth managed to qualify 13th for race four and finish in 13th in race five, surpassing all thenew Nissans for the first time. Significantly, Holdsworth also broke into the top 10 inSaturday morning’s practice, setting the seventh fastest time. But he couldn’tsustain it as the day heated up. V8 Supercars Commission chairman Mark Skaife said the moveto 3D throttle mapping would have been a significant issue for Erebus’ rivals. Skaife said E-Gas had also been originally approved on thebasis Erebus throttle motors would be supplied to the category as a controlitem when drive by wire became mandatory. Erebus CEO Ryan Maddison said the push for the significantengine upgrade – as well as more chassis upgrades – by the Perth event reflectedthe urgency with which the team, HWA and AMG were seeking performance upgrades.